Today Comcast Corporation (Nasdaq: CMCSA, CMCSK) and Liberty Property Trust (NYSE: LRY) announced that Comcast has signed a 15 ½ year lease for a new corporate headquarters in a building being developed by Liberty at 1701 John F. Kennedy Boulevard in Center City Philadelphia. The building, which was designed by world-renowned architect Robert A.M. Stern, will be named "Comcast Center," and is the largest private commercial development project to be developed in Pennsylvania. The announcement was made at a press conference today attended by Comcast Chairman and CEO Brian L. Roberts; Comcast Executive Vice President David L. Cohen; Liberty Chairman and CEO William P. Hankowsky; Philadelphia Mayor John F. Street; Dennis Yablonsky, Secretary of Community and Economic Development for the Commonwealth of Pennsylvania; Robert A.M. Stern, Principal, Robert A.M. Stern Architects; and Mark S. Schweiker, President and CEO, Greater Philadelphia Chamber of Commerce. The event took place at Liberty's offices in Philadelphia overlooking the future site of the building. Construction for Comcast Center will begin in mid-January 2005, and the building is expected to be complete in the fall of 2007. Comcast Center will rise 975 feet or 57 stories, and contain 1.2 million square feet of useable space. Comcast will initially occupy 24 floors, or about 44% of the rentable office space, encompassing 534,000 square feet. Comcast, which currently has 1,300 headquarters employees, is initially leasing sufficient space to accommodate more than 1,900 employees. Over the next decade, Comcast will have options to expand to accommodate 3,000 to 4,000 total employees. 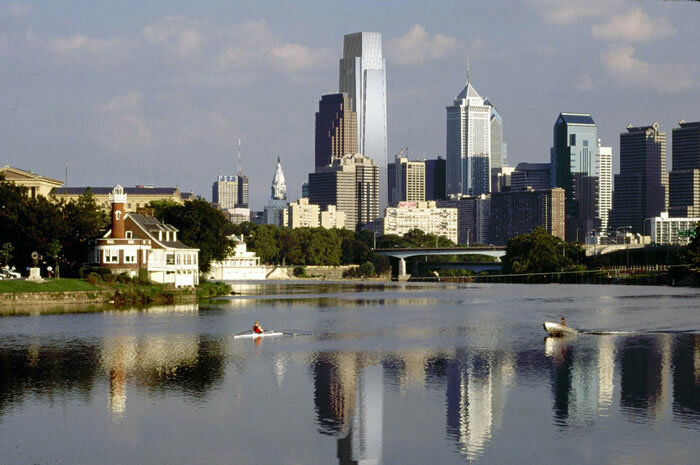 Comcast Chairman and CEO Brian L. Roberts said, "Our decision to build a new headquarters in Philadelphia is consistent with Comcast's unwavering 40-year commitment to Philadelphia and to the Commonwealth. Comcast Center will enable us to efficiently operate our headquarters and include the latest technology in the building's infrastructure. Our new headquarters will also include new technology research and development labs, technology demonstration areas, training space for our employees, and a new headquarters for Comcast University." Liberty Chairman and CEO William P. Hankowsky said, "Comcast Center represents approximately $435 million in private investment in Philadelphia and will reshape Philadelphia's 21st Century skyline. Liberty has a long history of successful and responsible development in Pennsylvania, and we are thrilled to be a part of this defining moment for the future of the Commonwealth and the City." Pennsylvania Governor Edward G. Rendell in a statement said, "This is a wonderful shot in the arm for Pennsylvania and for Philadelphia and a great way to ring in the New Year! For Comcast to make the commitment to maintain and grow its corporate headquarters in Philadelphia, and potentially add as many as 2,000 or more jobs over the next decade, is something all Pennsylvanians should be thankful for. More importantly, the significance to Pennsylvania of being home to one of the world's leading technology, communications, entertainment, and media companies is incalculable." Philadelphia Mayor John F. Street said, "Comcast Center will be a spectacular building that brings pride and job growth to Philadelphia. This project includes many notable public improvements, including a dramatic new gateway to Suburban Station, enhancements to the Suburban Station concourse, and a new street-level public plaza. Comcast and Liberty are undertaking the first major new commercial office construction in Center City Philadelphia in 13 years. As Microsoft is to Seattle and Coca-Cola to Atlanta, Comcast is a symbol of Philadelphia's growth and innovation." Roberts and Hankowsky both expressed their appreciation to Governor Rendell and Mayor Street and their respective economic development teams for their responsiveness and creativity in helping to facilitate the development of this project. The Binswanger Companies represented Comcast in their lease negotiations with Liberty Property Trust and will also serve as Comcast's project manager for the interior tenant improvement work prior to occupancy. The Company's content businesses include: Comcast SportsNet, E! Entertainment Television, Style Network, The Golf Channel, Outdoor Life Network, G4techTV and International Channel Networks as well as a minority investment in TV One. The Company also has a majority ownership in Comcast-Spectacor, whose major holdings include the Philadelphia Flyers NHL hockey team, the Philadelphia 76ers NBA basketball team and two large multipurpose arenas in Philadelphia. Liberty Property Trust (NYSE:LRY) is a leading real estate company dedicated to enhancing people's lives through extraordinary work environments. Liberty's 60 million square foot portfolio of office and industrial properties offers exceptional locations, flexible design, thoughtful amenities, superior service, and state-of-the-art technology to the Company's 2,100 tenants. Liberty increases the value of this portfolio through expert property management, marketing and development.